Recently I had the chance to try out 2 new products by FroliCat. The Fox Den, and the Multi Laser. Starting with the Fox Den, as shown above. 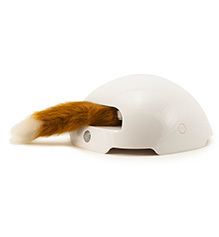 Let your cat have some fun and give it the FroliCat® Fox Den Automatic Cat Toy. With easy on/off features and automatic shut off, your cat will be playing with this all day. We have 2 cats, and they both LOVE cat toys. so I knew they were going to love this. As soon as we took it out of the box, both cats were swarming me, sniffing the cute little tail. Overall, the cats liked this, a lot. They spent quite a bit of time playing with it, jumping and twisting with eachother, and running off hiding, and pouncing! 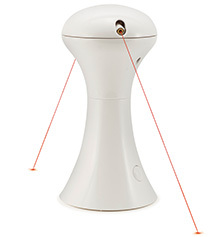 The next toy is the Multi Laser, which features 2 laser beams. My cats had a hard time seeing the beams, I had to keep pointing, and they were kind of looking at my finger but by the time they looked, the beam had moved somewhere else, so it was hard to get them to see it. I took them into a darker room and they were able to see it then, and they did chase it, but they definitely didn't enjoy this as much as the Fox Tail!. You can check out and purchase both products here!